Abstract: What's the modern-day personal transport for the senior citizens? Many choose the Airwheel A6S self-balance wheelchair. The old can keep up with time by riding A6S and they can ride it to visit friends, to go to market and walk dog etc. For those that are in the market for an affordable power chair, the search at times can be overwhelming due to the quantity of wholesale power chairs on the market, available for purchase. Here we recommend Airwheel smart wheelchair. Freedom and mobility are essential to enjoying life. Airwheel electric wheelchair permits a person to move around and enjoy a more active and independent life. Airwheel provides powered mobility equipment to the uninsured. Also, its price allows individuals to maintain their mobility with as little financial impact as possible. Airwheel A6S electric wheelchair catches the eyes of old riders because of its thoughtful designs. The designs of soft & wide saddle, smart handlebar controller, automatic kickstands and smartphone App reflect Airwheel is always user-oriented. 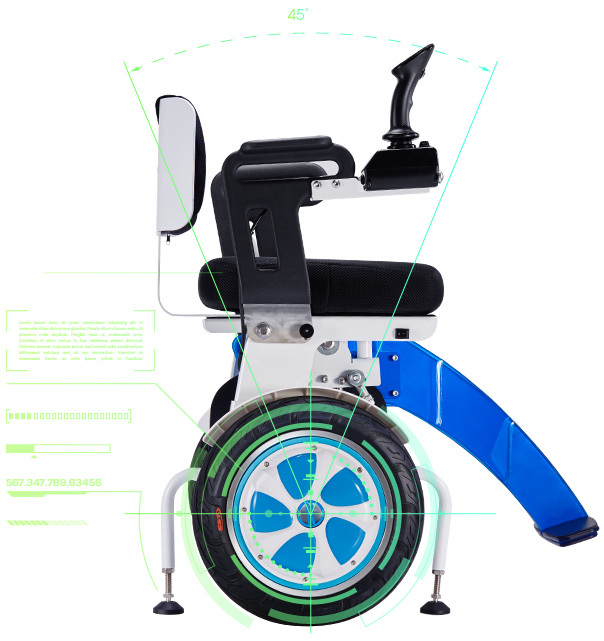 A6S power wheelchair chooses the aerospace aluminum alloy frame, with high strength, excellent corrosion resistance. It allows them to keep sitting while going forward which is not only labor-saving, but also increases riding comforts because of the comfortable saddle, branded lithium battery and powerful motor. Its saddle designed under the ergonomic principle, offers more comfortable ride than the traditional wheelchair does and avoiding you of being tired from long-distance travel. With the battery management system, the battery has 8-circuit protection which enhances the efficiency of charge and discharge. Riders just need to change controller's inclined angle towards right and left to turn directions. If riders intend to go forward or backward, they just lean their body forward or backward slowly and slightly. Also, the handlebar can be placed in the right or left side according to riders' habits. Furthermore, A6S motorized wheelchair has its smartphone app indicates the speed, temperature, power, mileage and monitor, so they can master the condition easily. Its high quality front and rear kickstands make it park stably and safely. Riders can go anywhere they want and enjoy a free intelligent life, just because of a smart gadget. Embrace the smarter tomorrow.